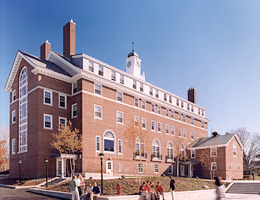 Woodman Associates Architects designed a major renovation of, and addition to Gehring Hall, one of the most architecturally prominent buildings on the Gould Academy campus. Gould Academy, a private independent secondary school, needed a new dining hall, additional dormitory space, and places for students and faculty to informally interact. Construction of the $2.8 million project began in 1998 and was completed in August 1999. Construction components were phased so the building could continue to be occupied as a dormitory during the school year. The renovation of Gehring Hall expanded the capacity of the dormitory from 40 to 68 beds and increased the number of faculty apartments from two to four. In addition, communal facilities such as a gallery, a formal lounge, and a residential sized kitchen were added. An entry ramp and an elevator have been added to make the entire building accessible to disabled people. All shared bathroom facilities are single user spaces to provide a homelike atmosphere. A five story addition on the north side of the building houses a combination monumental and egress stair. It will be the most heavily traveled circulation space in the building and therefore has been designed to be spacious and light filled to foster lingering interaction between students. It also provides expansive views of the mountains to the north through an arch-topped, four-story window.